AEE has long supported technology-neutral wholesale markets that allow all resources to compete based on price and performance. Competitive markets have opened numerous opportunities for the growth of advanced energy resources. The value of these markets, with new rules better equipped to integrate advanced energy, represent gigawatts of energy and billions in dollars of investment for the advanced energy industry. However, despite continuing progress in revising legacy wholesale market rules, many existing are still designed around traditional technologies. In our policy recommendations, we encourage Congress to ensure that FERC approves policies to allow advanced energy technologies and services to compete fully in technology-neutral markets by fully implementing Order 841 to eliminate barriers to energy storage participation in wholesale markets; finalizing a proposed rule on the participation of distributed energy resources in wholesale markets; and continuing to review existing barriers that can prevent advanced energy resources from competing on equal footing with traditional resources. Transportation electrification is a transformational trend in the U.S. economy, offering unprecedented choice to consumers and businesses in the way we move people and goods. With the price of batteries falling over 70% since 2010, all major vehicle manufacturers, including the major U.S.-based automakers, are now developing a full range of electric vehicle (EV) models. In addition to light duty vehicles, commercial fleets including medium- and heavy-duty EVs, transit buses, local delivery trucks and long-haul trucks are also making significant inroads. While the EV market continues to grow, Congress can prioritize key initiatives to deepen the electrification of transportation and grow the U.S. EV market by expanding support for key existing federal programs, supporting growth of EV charging infrastructure, and leveraging private capital to invest in new vehicles for localities and consumers. In the coming weeks, Congress may specifically look to enact a responsible fix to the existing EV tax credit, which now expires for each automaker just as it establishes a beachhead in EVs, to ensure American companies continue to lead the global market. AEE strongly supports this action. Our energy system is going through a period of transformational change. Evolving consumer preferences, dynamic new technologies and services, dramatically declining prices and the need to replace aging infrastructure are creating new opportunities across the country to modernize the electric power sector. Congress has an opportunity to harness the economic power of advanced energy to strengthen the American economy and put the fight for quality jobs at the heart of a vision for the country’s energy future. Congress can support policies that provides market certainty for businesses, focuses on technology inclusivity, and allows for all market participants to compete to provide services. Specifically, Congress can support harmonizing the investment tax credit (ITC) to include energy storage, extension of expired credits for energy efficiency, and passage of the Nuclear Energy Leadership Act (NELA) to promote commercialization of advanced nuclear reactors, as well as allow the federal government to pursue up to 40-year power purchase agreements with all advanced energy technologies, including wind, solar, and onsite generation. Large energy users – including Fortune 500 companies, cities and towns, universities, and hospitals – are increasingly seeking opportunities to source their energy needs from advanced energy. As part of this growing market, AEE facilitates the Advanced Energy Buyers Group. AEBG members are among the 71% of Fortune 100 companies and 43% of Fortune 500 companies that have established renewable energy and/or sustainability targets as part of our corporate sustainability commitments. In 2017, members of the Buyers Group totaled over $1 trillion in revenue and collectively consumed the equivalent of North Dakota’s electricity sales and powered their operations from renewable energy equivalent to the power usage of Delaware. As Congress considers energy legislation, AEE’s membership supports the principle of ensuring that federal policy increases market access to advanced energy for corporate purchasers. 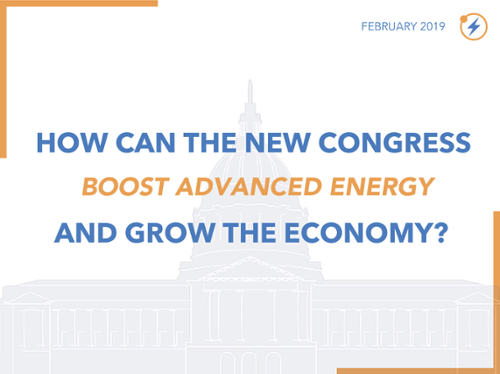 With advanced energy in the spotlight, AEE looks forward to engaging with the new Congress on these policy priorities.